Energy transitions have led to major advances in human wellbeing. However, little evidence exists about the scale of the net benefits. By developing a new method for identifying the demand curve, this paper estimates the consumer surplus associated with heating, transport and lighting over more than two hundred years and identifies the gains from key energy transitions. For certain energy transitions, the increase was dramatic, reflecting the transformations in society and lifestyles that mobility and illumination provided in the nineteenth and twentieth centuries. Yet, the net benefits related to heating technologies only rose modestly. Finally, due to saturation effects of the demand for energy services, future technological developments and energy transitions may benefit consumers (though not necessarily society as a whole) less than those in the past. 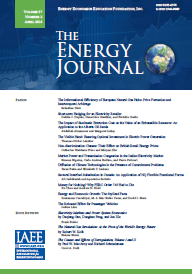 Published in Volume 39, Number 3 of The Quarterly Journal of the IAEE's Energy Economics Education Foundation.